I became a poet in schools back in the 1980s after my first book was published. I did several placements for The Poetry Society, who back then had funding from W H Smith. I did both primary and secondary school visits. One that stands out was in Wigan where I had the job of inspiring pupils from year 7-9 who were members of the school writing club. 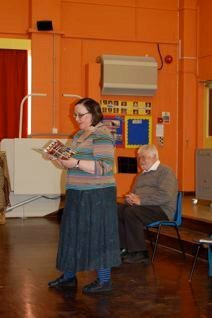 Amongst other workshops in the 2 day residency, I devised a drama on the Sinking of the Titanic, which resulted in some wonderful poems in the voices of actual real life people who were on the ship. I also toured many schools with The Bees Knees, as the co-operative performed together and sold books at many events up and down the country. I enjoyed this work so much, I eventually went into secondary school English teaching. Most authors in schools seem to be teachers first. Trust me to do it the other way round. Now after 16 years as a secondary teacher, and a few besides in FE, I returned to the freelance life in 2009, with all the benefit of that experience behind me. Now I carry out placements for Able Writers (with Authors Abroad), The Windows Project, Artscape and freelance as many schools also book me directly. I have also done A level masterclasses. My usual rate is £350 per day not including expenses. That is for a full day of workshops. I can also offer half days, assembly and other readings. Workshops can also be arranged on GCSE and A level creative writing and or poetry. I am a co-author of GCSE textbooks and I also write A level Literature critical books. I am happy to work with any age, but prefer keystage 2 upwards. Hello Angela,its Elarna from Riverside.The blog has been made from me and Jessica,the web address is ElarnaJessicaPoetry.wordpress.com,Its just been made so we havent uploaded any poetry yet.please visit when you can.I know yore very busy. you can put the group poem on your own blog if you like.